1. Review notebook assignments: BLAST and Homology. 2. Discuss the assigned reading: OrthoDB. 3. Introduce new topic: Phylogenetics. What do we mean by orthology and paralogy? What do we mean by orthology and paralogy? Hemoglobin example. Question : Using orthology to transfer the gene functional annotation from one organism to another might be inaccurate in some instances. What type of things do you think could lead to these inaccuracies? In other words, why is the function of the model organism gene not always the same as some other organism being compared to it? BLAST is an algorithm for comparing sequences, it searches the NCBI database. The NCBI Entrez tools provide an API interface to this database. These tools have facilitated the development of complex tools like OrthoDB. 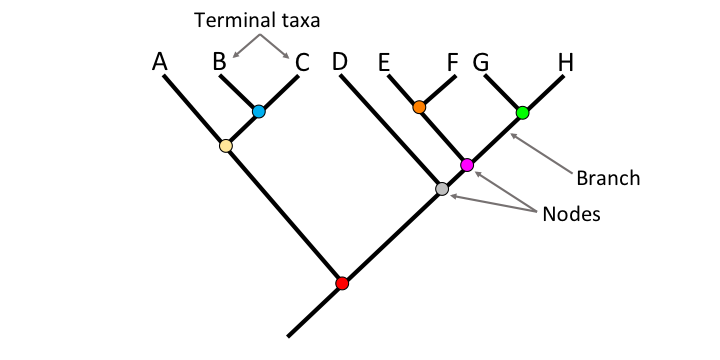 term = "FOXP2[GENE] AND Mammalia[ORGN] AND phylogenetic study[PROP]"
A practical guide to inferring phylogenetic trees.